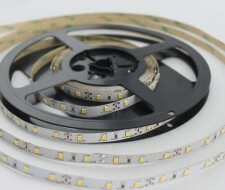 The 5630 Samsung LED type provides the brightest lumen output on the LED ribbon market with a CRI>90. Dimming via a LED dimming transformer or by an in-line dimmer. Available in IP20 and 3000K, 4000K & 6000K. It can be purchased by the metre or on a 5m reel and is easily installed with 3M adhesive tape on the rear. Cutting marks every 100mm. Also available in IP65 3000K, 4000K & 6000K. This is supplied on a 5m reel complete with a cutting kit which makes it suitable for all installations. Housed in a silicon tube and supplied with fixing brackets.